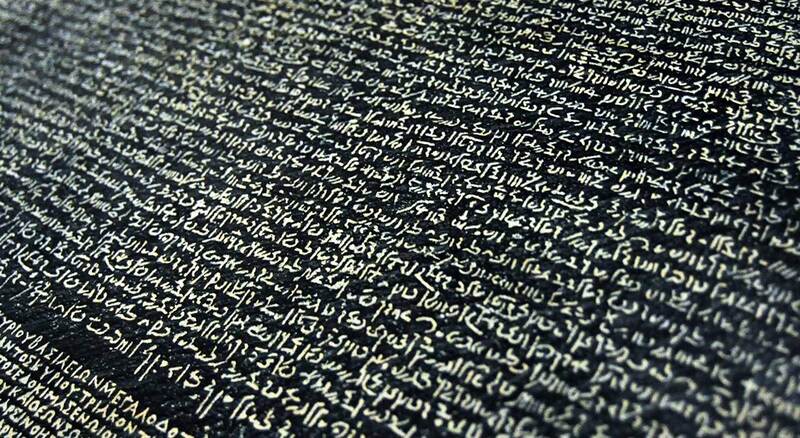 The first to make any sense of the Demotic script on the Rosetta Stone was a French scholar named Silvestre deSacy. deSacy was an important and skilled French linguist. He identified the symbols which comprised the word ‘Ptolemy’ and ‘Alexander’ thus, establishing a relationship between the symbols and sounds. Johann Akerblad who history records as a Swedish diplomat, looked at the Rosetta Stone with an additional knowledge of Coptic. Coptic was the language used by the Coptic church of Egypt, an early Christian group who preserved the language which was used as early as the 4th century. Coptic was written with the Greek alphabet but utilizes seven additional symbols from the Demotic script. Akerblad’s knowledge of Coptic allowed him to identify the words for ‘love,’ ‘temple’ and ‘Greek’ thus, making it clear that the Demotic script was not only a phonetic script but it was also translatable. The earliest translation of the Greek text on the Rosetta Stone into English was done by Reverend Stephen Weston in London in April 1802 before the Society of Antiquaries . About this time, both deSacy and Thomas Young, attempted to decipher the hieroglyphics on the Rosetta Stone. Young was successful in determining that foreign names could not be represented by symbols because symbols are based upon the words used in a given language. Thus, foreign names had to be spelled phonetically. In hieroglyphics there are groups of symbols that are separated from other symbols. These encircled inscriptions are called cartouches. Thomas Young determined that the cartouches were proper names of people who were not Egyptian like the names of Ptolemy and Alexander which in Greek were Ptolemaios and Alexandrus. He successfully deciphered 5 cartouches. His publication on this matter was far reaching. At this point there is involvement by a young French historian and linguist named Jean-Fracois Champollion. Champollion had mastered many Eastern languages. In 1807, Champollion went to study for two years with noted French linguist Francois Antoine-Isaac Silvestre deSacy. Later in his career, Champollion had compiled a Coptic dictionary and read Thomas Young in 1819. Looking at Young’s writing on the subject of hieroglyphics, he realized that what Young had actually proven was that all of hieroglyphics were phonetic, not just those hieroglyphics that were contained within the cartouches. Utilizing hieroglyphics from an estate at Kingston Lacey in Britain, Champollion correctly identified the names of Cleopatra and Alexandrus and verified Ptolemeus which had previously been identified by Young He published his results and continued his research. In 1822 new inscriptions from a temple at Abu Simbel on the Nile were introduced into Europe and Champollion had correctly identified the name of the pharaoh who had built the temple. That name was ‘Ramses.’ Utilizing his knowledge of Coptic he continued to successfully translate the hieroglyphics opening up an understanding of the Ancient Egyptians.